This is a quick guide on how to run seL4 x86 on VMWare Workstation / Player. Written based on decently up-to-date versions Workstation 9 & 10 Player 5 & 6 and for a Linux host machine. May work on Mac host machine, won’t work for Windows host (although general idea should be similar). This guide assumes that your project is all set up and configured to build for x86. Read Getting started otherwise. Both the free non-commercial Player and Workstation run seL4 fine; the difference with player is that additional setup is required to automate everything if you use Player. In order to start / stop VMWare from the command line you need to install VMWare VIX API for Player. Workstation comes with VIX and Player both installed. Once you get VMWare installed and running, go on and create a VM for seL4 (choose install OS later, and choose “Other” for guest OS type). After you have a VM, we want to add a serial port so we can see the stuff we print out. Go machine configuration -> Add device -> Serial port. Make sure this is the only serial port, and it is serial port 0. If you selected Guest OS type “Ubuntu” or something VMWare may set up a secret hidden serial port which you can’t edit from the GUI. Choose “Other” for guest type. Output to a text file (easiest but output only). The VM will dump its serial output to a text file when it runs, and you can simply go less -F <file>. Use physical serial port (best but requires serial cable + another machine to minicom/picocom off it). Set it to /dev/ttyS0 or something. and then minicom to /dev/tty99 or to /dev/pts/<whatever socat decides to use>. Choose depending on whether you can get a serial cable from your machine, whether you need output…etc. Easiest is to just use a text file. Once you have a VM, you’ll want to set up the hard disk partitions and get GRUB2 on the virtual hard disk and its MBR somehow. Easiest way to do this is simple install some Linux distro that has GRUB2 (Ubuntu Debian Fedora…etc). If you want to save some hard disk space you can try Ubuntu Minimal. Choose to install GRUB to the MBR when installing your OS. Alternatively if you feel like extra headaches to save space and time you can try install GRUB2 manually with grub-install from some Linux Live CD image. Now we want to edit its grub.cfg (usually in /grub2 or /boot/grub or something like that) somehow and modify it to boot our seL4 kernel + userland binary. Simplest method is to simply use VMWare player to boot into the guest OS you just installed, and then edit the grub.cfg from the guest OS itself. # Now do your editing in /tmp/vmount. Of course, change the --set=root <DeviceID> line to your DeviceID (set the DeviceID from other entries already in your grub.cfg), and also change the sel4-image-ia32-pc99 to match the name of your binary image that your Make produces (look in your build logs or in images/ folder). Also may be a good idea to add set default=<seL4 menu index> to the grub.cfg, so grub is configured to boot seL4. Now you have a VM ready, you’ll want to copy your built kernel + userland binary image over onto its HD, and then start the VM, and choose the seL4 option in GRUB, and then monitor the serial output. You will need to repeat this entire above process every time you build & run seL4. Fortunately I have a script does all of the above in one go (may need editing of paths here and there to fit where you put things). First, use vmware-mount to mount the vmdk disk image. Then copy your newly built kernel and user binaries over. 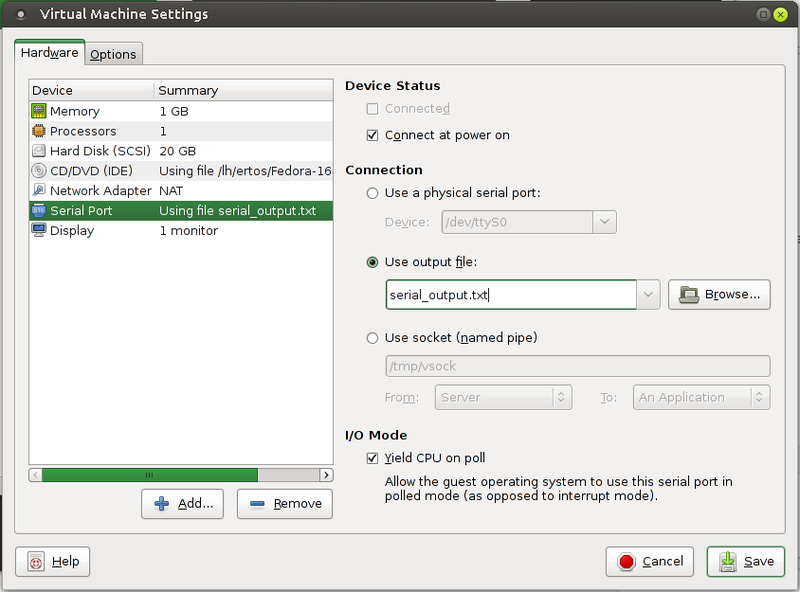 Then, unmount using vmware -d.
Then start your VM (either from VMWare Player GUI or using the vmrun script from VIX API), and choose seL4 boot option. Monitor serial output. If you’ve set up the seL4 option as the grub default then you just need to wait for the grub time out. If your kernel fails an assert during startup, make sure your kernel repo is up to date.